Welcome to the Moulin Vert Bakery! At Moulin Vert Bakery, we like to take our time handcrafting tasty baked goods from quality ingredients, using organic ingredients wherever possible, from as nearby as possible. We love to experiment with recipes from around the world and come up with some of our own, always tasting along the way. A day at Moulin Vert starts with the rumbling of our stone mill (yes, there's actually a green stone mill - we don't make this stuff up). We mill flours fresh each baking day from organic Canadian whole grains. Our breads require patience, starting from sour dough starter or a well-soaked sponge, so there is no need to rely on dough conditioners and the like to make up for lost texture in a rushed bread. 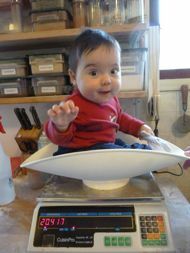 Our cookies and goodies also start from that same mill, aided along the way by butter, honey and local free range eggs. Our granolas are as whole and simple as a good breakfast cereal can get. As with all Moulin Vert products, we never add anything that doesn't need to be there. Our products are now available at Pepper's Foods at 3829 Cadboro Bay Road in the Cadboro Bay Village. Check them out! We've added more organic ingredients to some of our products: the Loons Cookies and Ken's Cookies are now made with organic oats. You can now find our products at the Mother Nature's Market and Deli in the Cook Street Village, and Ingredients on Store St.
We've finally finished our new bakery in Central Saanich and and will be moving our production from Saturna Island to our new digs on December 4. We're now available at a few more locations so you don't need to travel as far to enjoy our products. You can now find us at Local General Store on Haultain St., Aubergine Specialty Foods on Gladstone Ave. and Tru-Value Foods on Cordova Bay Rd.